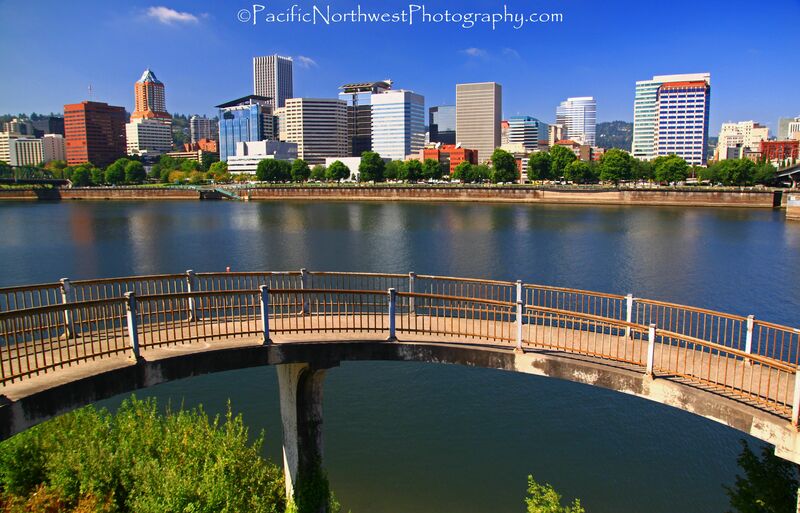 Here is another photo of downtown Portland, Oregon, taken from the East Esplanade. As you can see, it provides a completely different perspective of the city skyline, which includes a great view of the Willamette river and the walk way that leads to one of the many bridges. However, what you can’t see is the majority of the city skyline as for reasons mentioned on my last blog posting. This photo shows the Burnside bridge in the far left and the Morrison Bridge on the far right. However, you also can’t see any of the other 6 bridges that span over the river. Normally the river is pretty busy, on a nice day during summer, but I was able to get this shot with parts of the buildings reflecting off the still water. The trees are also a great photographic element in both the background and foreground. If you’re interested in taking advantage of some of the great spots along the East Esplanade I would highly recommend that you bring along a bike so you can complete the many miles of bike/walking trails in much less time. I normally ride the entire length of the East Esplanade and then ride over the steel bridge and then ride all the way to the South Waterfront. I then backtrack to the Hawthorne bridge and make the trek back over the river and sometimes repeat. If you decide to ride a bike, I would highly recommend that you leave your tripod in the car and be sure to bring along your wide angle lens. Is Portland, Oregon considered a major city or is it considered a big town? If you read several posts from visitors, recent transplants or from locals, you will hear several different ways to describe Portland, Oregon. Portland is considered the 22nd largest city in the United States, with just under about 675,000 residents. However, you wouldn’t know it by looking at its skyline. I have always been drawn to a cities skyline and I try to really capture it’s grandness by seeing how much of it I can cram into a single wide angle photo. Sometimes I can’t fit an entire city skyline in a single photo but that just allows me to take as many photos as I can and from different vantage points throughout the cities boundaries. However, Portland is a different animal since it’s high rises are somewhat spread out even though they are well within view from most vantage points. Sounds confusing but unfortunately there are several different parts that are located in several different localities within the cities core. 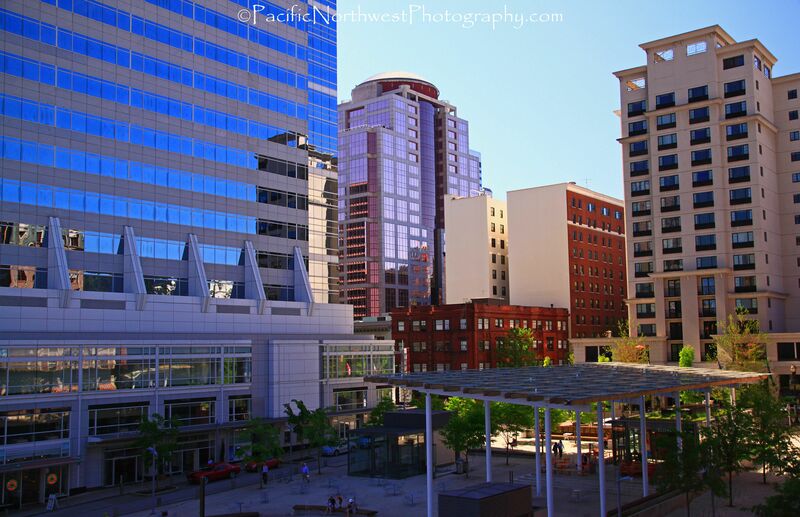 The majority of the buildings are located in the downtown hub but then there are several of Portland’s biggest building located farther to the south, called the South Waterfront, in the north east, called the Lloyd district, the north west, called the Pearl/brewery block district and last but not least the west side. What especially makes photographing Portland difficult is that most of the buildings are less than 40 stories tall. In fact, there are only 3 buildings that reach 40 stories. Most people also think of the snow capped mountains in the background of Portland’s skyline or the Willamette river and it’s many draw bridges standing in the foreground. I would say that having a city like Portland is a great way to really challenge a landscape photographer but it can really cause some serous frustration. 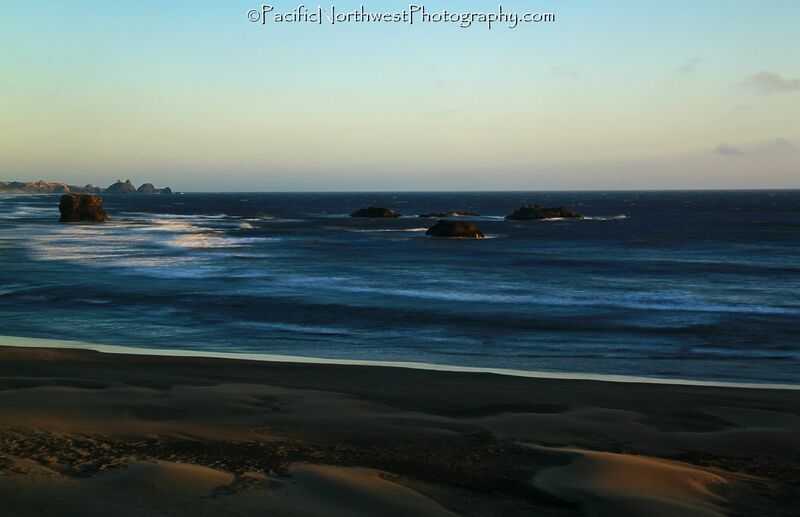 One of the best Coast lines, along the Pacific Ocean, sits between Brooking’s Oregon and Gold Beach, Oregon. Here is where you will find Oregon’s Gold Coast. You will find yourself drenched in the warm evening sunset’s, warm breezy afternoon’s and sunny and cool morning’s. Late summer and early Fall are the best times to experience the Mediterranean type climate that rushes through Southern Oregon’s coastline. Here you will also find Oregon’s pine apple express that brings warm offshore winds as they collide with the warm beaches. There are also hundred’s of miles of trails that take you inside the coastal mountains or drop you into the many private and hidden beaches. You may also spend several days navigating some of the amazing river’s that work their way towards the Pacific Ocean. If you don’t want to spend all of your time in hotel’s you can choose from the many camping grounds that are scattered throughout the region. If you enjoy taking photos I would recommend that you bring all of your camera gear since you will be amazed at the possibilities available. There are botanical gardens, rocky cliff’s, wildlife, waterfalls, creeks, lighthouses, seabirds, and the list goes on and on. The weather forecast for the Pacific Northwest is calling for several days of sunny and rare warm temperatures but chilly mornings. This creates the perfect opportunity to take advantage of the amazing views of the many snow capped mountains in the Cascades. The previous weather patterns brought heavy rain in the valley but brought abundant snow fall in the higher elevations. All you have to do is just walk, drive or hike to some of the higher elevations, above the valley floor, and you will have some pretty spectacular views. 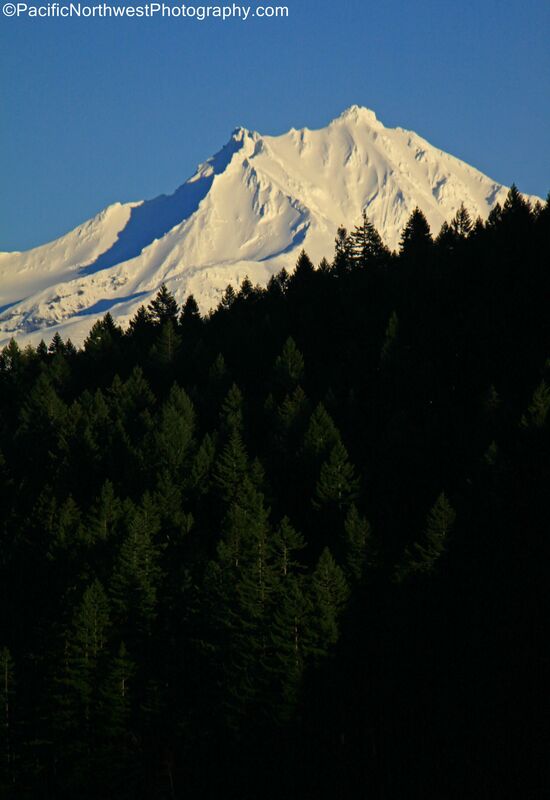 I took this photo of Mt. Jefferson, near Detroit Lake, with the forest in the foreground. Mt. Jefferson looks like a giant ice cream cone atop a green layer of sprinkles. To get this shot, I just made sure to use my tripod since the sun was starting to set and the glare from the mountain posed a problem by causing too much over exposure. I was also concerned about losing some of the sunny spots dotting the forest. I was fortunate to have a cloudless sky, which helped the mountain from being washed out and allowed the sun to cast an interesting glare over parts of the trees. If you plan on traveling around the Cascades in order to take advantage of this rare weather pattern, you want to keep in mind that the sun is setting much earlier and the sun glare can be pretty tricky. Make sure that you are on the west side of the mountains during sunset and on the east side during the early morning. The last thing you want to worry about is too much glare and washing out the snow capped mountains. Fall is now upon us and the foliage is starting to show their brilliant colors and the Pacific Northwest puts on one of the best displays! Lately, the Pacific Northwest has been getting hammered with rain and wind storms but the weather is now starting to turn cooler with parts of fog. This is one of the perfect ingredients to cook up some awesome Fall colors. The only thing missing is some sunny weather with just a dash of warmer temperatures. Luckily, we are predicted to get just that so be prepared for the foliage to put on a heck of a display over the next few weeks. Dust off your lens and make sure to remove your CIR-PL and don’t forget to either turn on your IS or bring your tripod because you can plan on having a pretty spectacular experience. However, if you plan on visiting any of the numerous waterfalls, you will want to bring a tripod but if you are going to be walking along some of the many neighborhoods or state parks, you can get away without a tripod as long as you can keep a steady hand and have a very good understanding of your camera’s settings. I always make sure to remove my CIR-PL, turn on the IS and mount my bubble level on the camera, in order to ensure that the photo is always level.